Playing around with that wonderful introductory box of Golden acrylics…..and really enjoying the grid composition lately on the 6×6″ acrylic canvas papers by Strathmore. Looking forward to having more time outside the office to create and to catch up on all of your blogs! Happy Monday and I hope you all have a fabulous week. Peace. Oh the light that shines from this stunning painting. It just shouts joy! Beautiful Laura! You are rockin’ those acrylics!!! Thanks, Jodi! Oh, they are so wonderful for abstracts! (I still can’t imagine painting realistically with them lol but I really admire people who can.) So much fun to play with color. I can’t think of anything better! Really glad you enjoyed this! These “window” compositions are jazzing me these days. Thanks, Laura! Love the imagery you’re conjuring there. Would be really cool to do some abstract tulips in acrylic! I look forward to seeing those tulips! Thanks, Jean! Your flowers are decorating my desk this morning; thank you so much! I love the contrast here. It speaks to me of the light that I don’t always see for the darkness inside. Very powerful. Wow. Thank you so much for sharing your powerful and moving response to this painting. I really appreciate it. I was having a “coming out of the dark” feeling as I was painting it. Abstracts can be wonderful journeys into and through the mind. Thanks, Carmel! Ooh, a soap opera is forming … lol. I really enjoy throwing a whole bunch of color together. It may be a bit of overkill but I love that they won’t move unless I blend them together. Appreciating the benefits of acrylics! I love the light in this painting. It glows. It reminds me of windows in an apartment building with the glow of lights shining outward. Thanks, Carol! I think we’re all in a place of wanting to bring those spring colors hence! Hehe. I love putting a bunch of colors together and watching them go. Glad you enjoyed this! Gorgeous colors! It’s like spring coming in the window. Thanks, Teri! That’s what I was going for! I’m so glad it translated! I’m so glad to be able to do that, and thanks Sharon for your lovely comment! It’s that yellow that just snaps my attention. Beautiful! Thanks, Kirk! So glad you enjoyed it. I do find that Hansa yellow to really speak loudly but in the best of ways. Thanks for stopping by. So glad you liked it, Rebecca! I can’t wait til you start flinging color at your canvases! I have had a few goes, check out pouring medium, and stringy gel by liquitex. I have a few examples from my play, ( under abstract). Pouring medium, is such fun. I’ll check it out! Sounds like fun! Looks like a gorgeous stained glass window at church with the morning light beaming through! Glad to hear you will have more time to create – it is enriching for the soul!! Thanks, Carol and yes it really is. What a perfect way to describe it! Sunday is my only chance, Susan! Oh I had fun. I just love those paints! I understand totally what you are saying. They can’t all be home runs though. I think it’d get boring if it was too easy. Have you ever thought about doing a 30-day painting challenge, Jill? You wouldn’t have to announce it, because maybe then it would start to feel pressure-ish, and they wouldn’t have to be all big paintings or anything like that either. But I just wonder if you did a little flower even, just something small, or just a painting of any subject every day for a month, maybe you’d start to find your style that way? You’re welcome, Jill! I plan to do something similar. I’d love to commit to a small painting a day, every day! But I don’t want to feel pressured. But…abstracts are so freeing. Not pressure-y at all. Right? So when all else fails, leaf through an art book and abstract your thoughts. (Talking to myself now, but I bet this would work for you too.) Wouldn’t it be cool to do just one small painting a day? I started doing one quick drawing a day last May(ish) and my drawing skills really improved. It took awhile but I feel like I am finally starting to find my style. Or at least, some semblance of it. But I think doing it daily really helps. Especially when our memories aren’t what they used to be lol. At least you’ll remember tomorrow what you learned when you painted today. Yes, Jill, sounds good! I know what you mean about liking lots of mediums. I think we’re the same. The thing is, for me at least, I feel painting is my weakest and that’s probably where I need to practice more. I remember last July when I painted every day in watercolor. I learned so much (but have probably forgot a lot of it lol). I think now, I’d probably want to paint daily but not restrict myself as to medium. Definitely need to play more with those acrylics. Particularly the Golden ones! Jill, you are so right about them, they’re like magic! Which type do you prefer? Do you like the Open ones best, heavy body, high flow or fluid? I’m trying to decide lol. I just know I want to buy some purples. Must be a spring thing but it’s all I can think about lately is purple acrylics! I’m glad I was able to help sort this through for you. I am definitely art-ADD so it helps me, too, to talk this out! It really does! I can’t believe how potent those colors are! Do you have a favorite color in the Golden line, Jill? I think quin magenta and hansa yellow light are my favorites so far. I’d love to hear yours! You have great taste! Any suggestions of what to buy, lol? hehe Not hard to convince me I “need” art supplies. Aw, thanks, Teresa! I hope they took you to Jamaica and then from there, to Hawaii! We can dream, right?! Oh, yes! 😀 And your art is definitely dreamy! 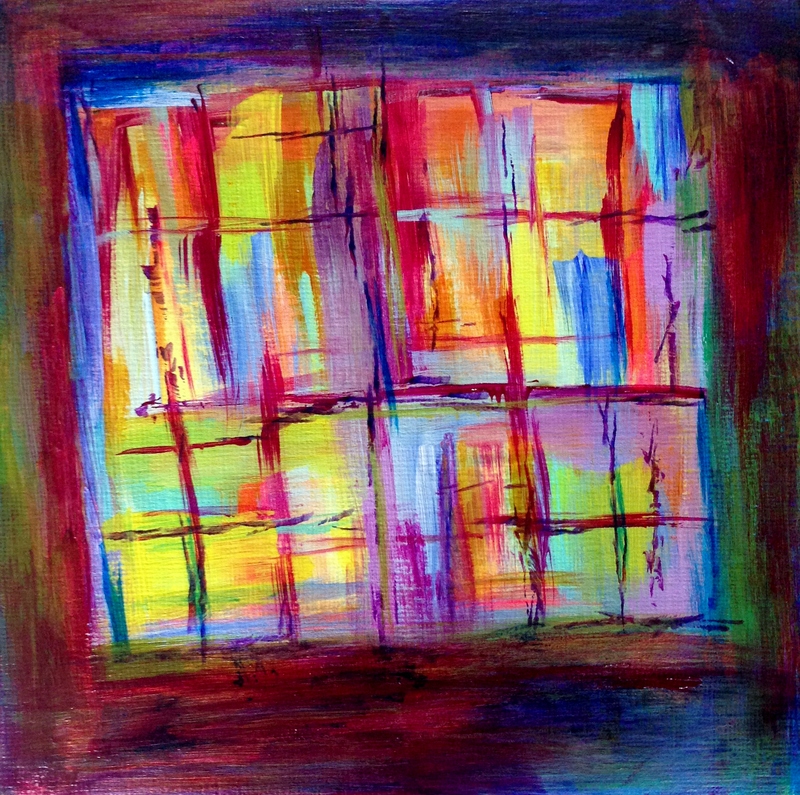 A great combination of brilliant colors Laura – love this window. Beautiful work!! The life and light of the spring transforming the dark winter evenings… or maybe we’re looking in and it’s just some people having a wild disco 😉 Either way, a joy indeed – beautiful stuff! Thanks so much, Jacob! It is so much fun to play with color. There is nothing better! So glad you got a kick out of this! Your artful play is always inspiring and beautiful to see. Love your use of color and light, really brings out the joy of painting. Peace. I see a great plaid pattern here! Thanks, Deborah! I’m so glad you see it that way. The cool thing about this painting is if you turn it to the light, there are three gold crosses in there too. Most people would never know they’re there, but I love it that they are. I’m really glad you like this! Wow, perfect for Easter, and really special! It’s not so bad to explore and repeat an idea. Many artists have done so and continue to do so. Subtle changes can teach you a lot. I’m not finding it boring at any rate! Awww thanks for saying that about my WC…😊 Hehe…and that last bit is so true! It’s fun to see all the variety in art! That’s what makes it so wonderful! Oh what a kind comment, thank you Denis! I’m so glad you like this. The colors are just so amazing and acrylics are so much easier than watercolor in that I’m less likely to make mud by putting yellow next to purple. Anything that gives me freedom is a good thing! I hope you are well over there in Oz. Still waiting for my sketching kit to arrive from the UK. Any pencil and paper is good to start with Denis! I’m excited for you! Thanks, Myriam! I’m so glad you’re enjoying my window series. I hope I have a few more up my sleeves but I may need to change it up a bit. I’m glad for art; it really makes stressy times bearable! Loved the vibrancy of colors 🎨😍Hope your workload became light by now! Have a great week ahead. Not til after April 18, Snehal! But we’re getting close. Thanks for stopping by. I love the colors in that acrylic set. They are so bold and bright! Thanks Sabrina! Glad you enjoyed! Aw thanks jenny! I’m so glad you like it! I have so much to learn but I love color and just playing with it. Sometimes the results aren’t quite as nice lol but I was happy with this one. It’s nice to be able to save a painting if it’s not too far gone. In acrylic, that is. I hope it warms up for you soon! hi Laura, I’m sorry I missed this one! Monday was the day at specialists, thats why. oops. Love the window Interior’s colors, design patterns! so lovely! my fav Goldens are Indanthrone blue, quinacridone azo yellow and orange, ultramarine, quin magenta, quin burnt sienna/orange…. but I cant live without the Indanthrone! for feedback on your window…. one thing I could mention… is there could be more (20% or so) Lighter Tones. the overall light mid dark ratios are just a wee bit on the ‘darker/mid’ side and not quite there for the ‘Light tone.’ White paint. could be a solution. white mixed with the yellow, even better. Thanks my kind friend. You’re giving me pearls, here! I always aim for more light than I wind up getting but I’ve not been aiming high enough. Thank you so much, now I have my marching orders! Bless you, 3D! EEK! Art emergency! I don’t see Indanthrone blue! But I see PB 60 Anthraquinone blue – here is the link: http://www.goldenpaints.com/products/colors/heavy-body/anthraquinone-blue Is this the same thing, Debi? Thank you so much! I always enjoy your quilts too! LOVE your artistic ‘stained glass’ creativity, Laura! Thanks so much, Donna! I need a little birdie face peeking out of one of those panes lol. So glad you enjoyed it! I really like all the color in this. It really has a glow to it! Good painting! Thanks, Leslie! I have a lot to learn compositionally with these abstracts, but I’m making the journey! Glad you enjoyed it!